This is part of a guide to the identification of particles seen in samples of free particles. It is designed to allow access to files using any significant feature noticed by the microscopist rather than requiring a specific set of measured parameters. Often the most significant feature of a particle is unique to that particle type and so is not a useful diagnostic element for a broader Key for particles in general. This guide will lead to the same particle through a number of different paths depending on features and the order of significance placed on those features by the microscopist/analyst. When a particle is found that appears to be similar to the one being identified it may be useful to go to the file of particles of that type. For instance, if it looks like a starch grain then it may be useful to go to the "Starch" file in this gallery and see a larger variety of starch grains for comparison. The photographs of the particles shown here are both from standard sets and from environmental samples collected over many years by this laboratory. This file includes transparent isotropic particles of any shape. These are isotropic particles that are in fact crystalline but belong to the cubic crystal system. These may be colorless to any color. They tend to be a form of glass, inorganic or plastic, formed from the melt. The presence of gas bubbles often has significance with regard to the original substance that had been melted. These particles may be any color and may show interference colors as in the case of some cosmetic particles. They may have accessory structures as in the case of fragments of insects. Skin flakes may appear isotropic because they have very low birefringence and are rather thin. Fibers are diffined here as structures with essentually parallel sides that are at least five times as long as they are wide. 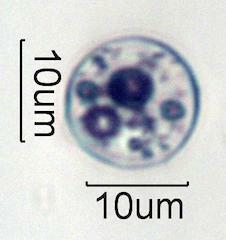 These fibers tend to be either organic or inorganic glasses though some plant phytoliths are in this category. These particles tend to be glasses, slags, or crystals of the cubic crystal system that lack any cleave plane, garnet for example.